Traveling by airplane is one of the best options that one has when it comes to crossing extremely long distances. Traveling by car, by bus or by train can also be fun and leave you with amazing memories, but there isn’t a better alternative that brings the comfort and speed of an airplane. Also, traveling by airplane helps you escape from reality for a little while, recharge your batteries while admiring incredible views from the sky and remind yourself that flying is possible and you should take advantage of it. However, long flights can be very tiring, especially if you spend more than 6 hours on the same chair. Most plane seats aren’t exactly the definition of comfort, which is why it is always useful to have practical accessories with you, in order to make your flight more comfortable. The neck pillow is one of the most important accessories that one should consider including in the hand luggage while flying. It helps you rest your head comfortably and to sleep worry-free. When you lack a travel pillow, some of the most uncomfortable situations can happen. You can fall asleep on your neighbor’s shoulder, your head can fall or you can wake up with an incredibly annoying neck pain. Other than the four characteristics above, you should also look for travel pillows that are affordable and highly portable, as you will probably want to put them in your hand luggage. Are you traveling a lot? Do you experience neck pain days after a long flight? Then you definitely need to try this travel pillow that comes with an innovating, award-winning shape. It comes with a pillow for the side of the head, a pillow for the back of the head, chin support and neck support. Also, it is soft and comfortable and can be easily folded and packed into your luggage. This is one of the best-selling travel pillows, not only due to its unusual shape that helps you rest during the entire flight, but also due to the fact that it is entirely washable, it is lightweight and occupies little space in your bag. Also, it proves to be convenient regardless of the airplane seat that you choose. Whether you are sitting next to the window or in the middle of the row, you will be able to rest comfortably. This travel pillow is extremely likeable, thanks to its three support cushions, the soft fabric that it is made of, the ease of use and high portability. More than that, it has a good price and it can be used by the entire family due to its medium size. Although the size of this travel pillow is really convenient when it comes to sleeping during your flights, you might consider it a bit too large to fit in small luggage. If you get cold easily during long flights and you also like to sleep to make it seem like time passes faster, this neck support pillow could be what you are looking for. Just like the cushion above, this product also comes with its innovation. The people next to you might think that you are wearing a scarf, but the inner part of this thin pillow includes a side neck support that lets you sleep comfortably, without having to keep your hand under your head. It is made of a soft fabric that will not irritate your skin and measures 7.5 x 7.5 x 3.7 inches, which makes it great to travel with. It folds easily, exactly like a scarf and only weighs 3.5 ounces. Most people would say that it is better than common U-shaped foam travel pillows, because it is thin, soft and no one can tell that you are using a head support. 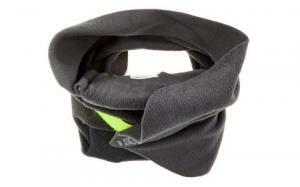 What’s to like about the Trtl Soft Neck Support Travel Pillow, Machine Washable? This neck support isn’t exactly a pillow, but it plays one’s role and makes an practical accessory during airplane travels. The biggest advantage of this product is that, unlike most travel pillows, it does not look awkward on you when sleeping, thanks to its invisible support. More than that, it can keep you warm during your sleep. Also, it is important to know that it can be used on both the right and left side, so you will be able to change positions from time to time. Except for the fact that it does not offer head support, so your head might fall forward if you are a heavy person or a moving sleeper, this neck support is great and offers value for money. This is a travel pillow that combines the traditional design with the advantages of modern technology. It is an affordable travel companion that is meant to provide you the head and neck support that you need and alleviate any neck, shoulder or upper back pain that you might have. It can be used in any vehicle or airplane while traveling, but also for relaxation purposes, while at home. This travel pillow measures 12 X 10 X 3.7 inches and weighs 11.2 ounces, it is made of memory foam and it is easy to fold and transport in your luggage. Thanks to the thick memory foam, it molds perfectly to your neck and head, providing amazing support. The greatest thing about this product, though, is that it is covered by a 5-year money-back warranty, which makes you think that it is durable enough to last that much. 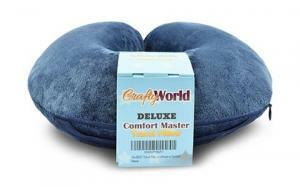 What’s to like about the Comfortable Travel Pillow, Get Wrapped in Extreme Comfort with the Comfort Master Neck Pillow? This memory foam pillow is one of the best traditional neck accessories that you can take with you on for a long flight. It is comfortable, it offers exactly what it promises to offer, it has a compact design and it is easy to maintain. Washing it is easy and carrying it around does not represent an issue, as it is lightweight and easy to fold. The traditional design and the comfort that this pillow brings are essential during air flights that take hours. However, the back of the neck pillow is a bit too thin. If you are a heavy person, you might feel slight discomfort after a few hours. If luggage space always represents an issue when traveling and you have nowhere to fit any other objects or accessories, this travel pillow is exactly what you need. This is an inflatable neck pillow that comes with a great neck support and that is covered in blue velvet. It is extremely comfortable and can help you sleep like a baby while flying. The great thing about it is that it inflates using nothing more than the push of a button. The inflation is adjustable, so you get to decide the level of its firmness. If you don’t want it to be entirely solid, you can start releasing the air by simply pushing the black air valve. It comes with a free sack that makes transporting the pillow easy and comfortable. What’s to like about the FANRY Push-Button Inflatable Travel Pillow Luxuriously Soft Inflatable Neck Pillow with Velvet Neck Support for Sleeping on Airplane, Car, and Train? The scientific design of this travel pillow is what most drags one’s attention from the very first moment. It comes with a raised neck support that proves to be very comfortable during a few hours’ sleep. Also, it is lightweight and easy to carry. The fact that it inflates is a huge advantage, as it occupies less space than other similar products and it gives you the option to adjust it to your needs. This travel pillow is incredibly practical, but if you want to use it at home for relaxation purposes you have to be careful about its solidness. After a few days of using it, you might want to inflate it a bit more, as it slowly loses air. This is the right product for you if you are looking for more than just a travel pillow. You are a music enthusiast and you always affirm that time passes more easily and enjoyable when you listen to your favorite playlist? 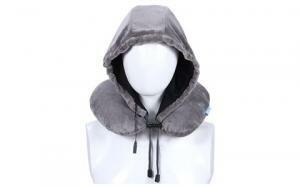 Then this travel pillow that comes with a velvet hood and a music speaker is exactly what you’ve been looking for. We bet that you didn’t even know that such a neck pillow existed, which is another reason why you should become interested in this product. It surprises most consumers with its comfortable fabric, washable cover and fashionable design. It measures 9.1 x 5.5 x 1.3 inches and weighs 10.4 ounces, is it easy to carry during your travels and more importantly, it helps you hide from the world and escape into a deep , restful sleep. What’s to like about the Airplane Travel Pillow with Music Earbuds (grey)? Technology can be found in any object nowadays. The fact that it can make our lives better and more comfortable is incredible. For instance, this travel pillow is so much better than other traditional ones, because of its ability to connect with a smartphone. This way, you get to listen to your favorite tracks and travel comfortably, too. The idea of having a travel pillow with a hood and music ear buds is amazing, but the speakers play the sounds a bit too slow. However, if you don’t like to listen to music lightly, you can replace the plugs. Is your neck pillow for airplane comfortable enough? If you travel a lot by airplane, train or by bus and you use a travel neck pillow, but you still experience neck and back pain, there is a chance that you are using the wrong one. Surely, one the first steps to be taken is to ask for your physician’s advice and check the alignment of your spine. More often than not, our generation suffers from poor spine alignment due to improper posture and doesn’t even realize it. Knowing that makes it easier to take the necessary precautions and use the right accessories while traveling. The next step is to ensure that your neck pillow is made of the right materials, has an ergonomic shape and is capable of offering the support you need. Memory foam neck pillows are the most popular in their class and for good reasons. Their shape adjusts according to your needs, but you need to choose the right degree of firmness and density in order to feel comfortable throughout the trip. The best neck pillows are recommended by chiropractors and doctors all over the world. Although they have been first created for those who suffer from chronic neck pain, it is also a great accessory for people who want to prevent such a condition or simply relax. Is a neck pillow really capable of reducing neck pain? Neck pillows were created with this very purpose in mind: to alleviate neck pain, to promote correct posture and neck alignment. When used on a regular basis, it really makes a difference. Some people like to sleep while traveling, while some simply want to be able to sit in a comfortable position. Regardless of your purpose, after using a high-quality neck pillow, you will observe that it will hurt less and that your mood will be considerably improved. Some users even mention the fact that their entire perspective over traveling changed after starting to use a memory foam neck pillow. Why are neck pillows worth buying? Neck pillows are extremely comfortable and don’t have to be made of memory foam to offer you the benefits that you need. Some high-quality products are made of wool, down, polyester and other materials that promote relaxation. Besides the relaxation factor, they are well-known for being able to alleviate sleep apnea, reduce snoring, increase the comfort during sleep, reduce joint pains and protect the cervical spine. Imagine that you could eliminate at least one of these annoying things from your life. Do you think that your traveling routine would be different? If the answer is yes, then you shouldn’t wait any longer. Neck pillows are worth buying for all the above reasons and more: you get to breathe more easily, you will start to associate traveling with relaxation, you will reduce the risk of falling on the person next to you while flying and you will have a correct sleeping position. 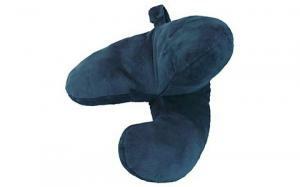 If you are a frequent traveler, a U-shaped neck pillow is probably the most suitable option for you. As for the sizing, you can choose somewhere between 3 to 5 inches in height and 10 to 12 inches in length. The market has a rich offer when it comes to travel pillows, but as everyone has different needs, it can be difficult to find the one that meets all your requirements. Generally, if you look for the fabric you light, the firmness you enjoy while sleeping and the technology that you need, you should be able to find a neck pillow fats and easy. From the reviews above, you can tell that there are plenty of differences between travel pillows. Some are traditional, some are innovative and some include great tech features. Also, there are inflatable travel cushions and fixed ones that are suitable for different types of individuals. Are you a constant traveler who likes to pack no more than a few things and leave for the airport? Then a medium-sized, comfortable pillow with great neck and head support might fit in your luggage. On the other hand, if like to travel rarely, but for longer periods of time, most probably you will have limited space in your luggage, so you will need to find a solution such as inflatable products. No matter what you choose, make sure that you try it first, just to see if it is really meant to satisfy your requirements.